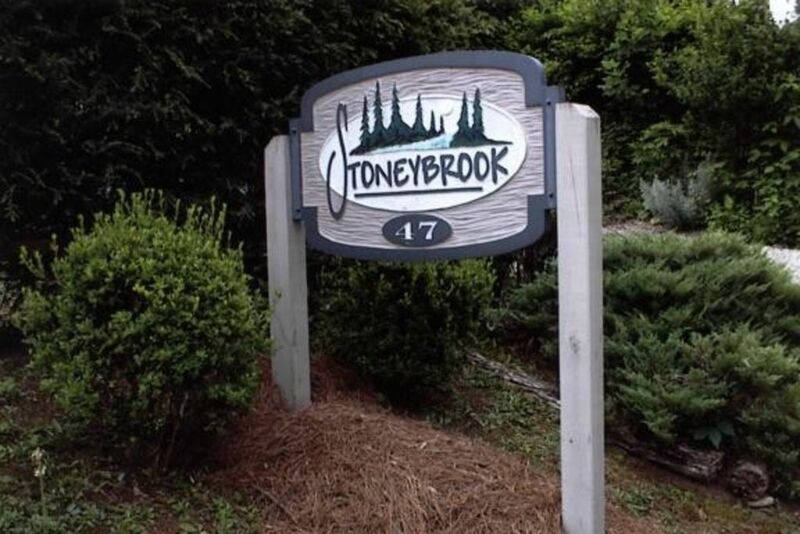 Stoneybrook is an extraordinary property that has numerous streams with massive stands of laurel and lush foliage bordered and protected by the US Forest Service. Enjoy walking the nature trails with unusual native wild flowers and an awesome stand of trees of many varieties (some of which are marked and identified... one hickory tree is estimated to be 150 years old). The very spacious 24 by 28 feet outdoor pavilion with a stone fireplace is a favorite gathering place for each guest. Imagine a romantic evening listening to the crackling fire with your love, regardless of the weather or curl up with a good book while listening to the beautiful song birds and the babbling brooks. We provide many magazines for your reading enjoyment. You will find many books with points of interest of this area and games and such for children. Provided are two mountain bikes for your pleasure. The Vineyard with hardwood floors, cathedral ceiling, skylight windows, and cable television. Brookside offers hardwood floors, natural finish tongue and groove pine board paneling decorated in nature wood motif. The Nantucket says it all. It has its own skylight bathroom and is decorated to match its name. The cottage, according to many guests, has more to offer than just being a great vacation spot. It is nestled on 3.2 acres bordering Mount Pisgah National Forest and it is located only 10 minutes from the Blue Ridge Parkway. Each of the three bedrooms and 2 baths have been totally remodeled...hardwood floors, cathedral ceilings, skylight windows, tongue and groove pine paneling are some of the unique features. Snuggling in comfortable beds as the Katydids sing you to sleep is a dream come true! Beds are 1 king size and 1 queen and 1 full size beds with luxury bedding for your comfort. Home is surrounded by beautiful Western North Carolina mountains. Good selection of music cds, for your enjoyment. Speakers under pavilion for outside entertainment. Good selection of videos, cds and dvds. Large front deck with copper caps adorning each post. Two sets of steps for easy access and exit. Covered entrance to front door with cast iron table and chairs. Free long distance phone service. Smoking is not permitted inside home. Smoking is permitted outside under the pavilion or on front deck. Full Kitchen: A new kitchen with cermic tile, valted ceilings,over the stove microwave, work island w/bar and bar stools,TV in kichen that will allow you to keep up with the games, news,cooking channel, or your favorite soap. Gas/Electric BBQ Grill: 1 gas grill and 1 indoor/outdoor electric George Forman grill. Deck/Patio: Large front deck with copper caps adorning each post. Two sets of steps for easy access and exit. Covered enterance to front door with cast iron table and chairs. (fire wood provided) Phone with answering machine, heat & air, 3 Cable TV'S, CD Player with assortment of CD'S, Toaster, Bed & Bath Linens provided, Electric in-door/out-door George Forman Grill & out-side Gas(BBQ) Grill, Table and Chairs are provided under the Pavilion for out-side Dinning, No Smoking in-side home. This is by far my favorite place I've stayed as far as an airbnb or vrbo home! The outside fireplace is amazing! We've already talked about staying here again. The hosts were very responsive to any questions we had. It's less than 30 min to Ashville. The only thing we missed was being able to bring our fur babies. Very well appointed, great location, awesome stay. We would stay here again - wonderfully appointed, great location, beautiful large running creek behind house with beautiful gardens. Perfect stay. Elmer and Ruby have made a lovely, well stocked, perfect NC mountain retreat. There is so much attention to details in their house, outdoor area and the surrounding property. We instantly felt at home and were in awe of how beautiful and cozy it was. Just bring your family and food, stay in and enjoy the scenery, or take a trip a little ways to the Blue Ridge Parkway or down to Waynesville or Ashville. Can't lose! We hope to stay here again in the future. I would highly recommend a stay at Stoneybrook! Everything was just perfect. Elmer and Ruby’s cabin is just beautiful and they have thought of everything. We really enjoyed our stay and will definitely be back! We were so pleased to have you stay at our property , and glad you found everything perfect. We do hope if you are vacationing in the area again you will choose to stay with us again. Just about everything one could possibly want was there. Place was clean, neat, and well cared for. Bed (king) was very comfortable as were the 2 rocker/recliners in the little living room. There was also a very nice area you could walk to back by the creek. Horseback riding, hiking, biking, swimming, wildlife viewing, rock climbing, golf, tennis, fishing, shopping, restaurants, museums, cinemas, theaters, skiing, sightseeing, visit Biltmore House & Gardens and Winery, view local waterfalls, fish hatchery, sliding rock and many other attractions. Checks, Book on line 10% military discount (unit name required) 10% DISCOUNT for Military Personnel (Unit Name Required) Cancellations made 30 days prior to arrival date deposit will be refunded 100% less a $25.00 processing fee. Cancellations made less than 30 days deposit will not be refunded 10% DISCOUNT for Fireman and any Law enforcement (city & station # required).